Belly-Mounted 80-In. Mower "Turns On A Dime"
Convert Your A.C. Welder to D.C.
Homemade Shelves Keep Steel Tubing Neat And Organized. 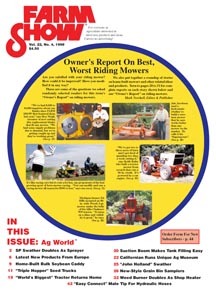 Mower Racing Catches On As "Family Sport"
"Shur Connect" Eliminates Voltage Loss To Monitors ect. They Remanufacture Turbochargers For Cars, Farm Machinery, Semi, etc. Truck-Tractor Combo Built "Just For Fun"